Hello and welcome to MJS Auto and Marine Mobile mechanics. I’m a fully qualified motor vehicle technician with 24 years experience. I carried my apprenticeship with Rover, became a Master Technician and then a top Diagnostic Technician. I worked for 7 years at Ricardo Engineering testing and servicing prototype engines for all major manufacturers, I then became ‘Lead Patrol’ for the RAC honing my fault finding abilities to attain the 2nd highest fix rate in the South East region.I offer mobile servicing and repair to all makes and models of cars and boats. I am passionate about MG Rover and LR Freelanders, especially the K series engine that powers them! Unfortunately this advanced lightweight engine does have an achilles heel! ► Temperature gauge higher than normal? ► Expansion tank below minimum or sludgy? ► Heater ONLY blowing cold air? ► Water droplets or creamy oil? ► Poor running, excess smoke from exhaust? Any of the above could be head gasket failure!My fully mobile service will come to your home, work or place of breakdown. I can carry out the work there or recover the vehicle to your home for the repairs. All head gasket repairs are carried out using the latest MLS “Multi Layer Steel” gasket, I will also replace the inlet, exhaust and cam cover gaskets, replace the oil and filter, change the antifreeze and thoroughly test the cooling system. All at a fraction of dealer prices. 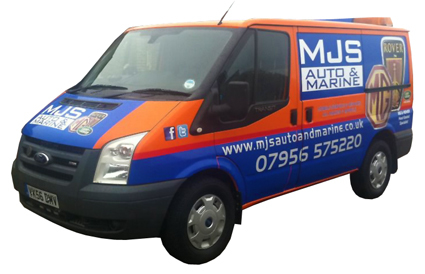 MJS Auto & Marine offer you quite possibly the best mobile head gasket service of its kind. 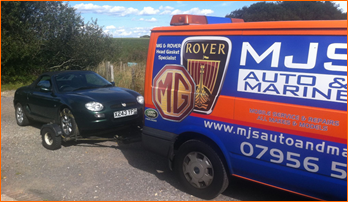 For mobile service and repairs to your MG Rover, LR Freelander and all other makes and models, please ring now for an up to date quote or fill out the form on the contact page. All work is guaranteed and a full invoice is given.